Grad school forces you to live life in a tiny bubble. You spend all your time constantly swamped with making progress on your research project and trying to publish something (anything) meaningful. It can be difficult to keep up with much else: eating, sleeping, a social life... not to mention the important things like reading all the notable historical papers in your field and keeping up to date with current publications of your colleagues and competitors. All this makes it downright impossible to stay on top of advances in scientific fields outside your own. Who has the time? I was so excited to learn a new word yesterday: Optogenetics. Optogenetics, a not-that-new term coined by Karl Deisseroth at Stanford, is a way of using light to precisely stimulate parts of the body. It's done by embedding certain light-sensitive proteins into tissues or cells, which can activate the cells by exposing it to the correct wavelength of light. You guys! 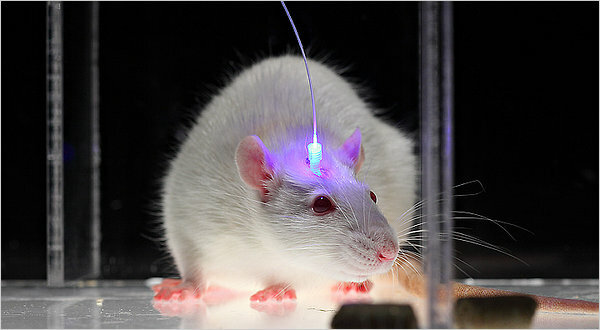 They can control a rat's brain with frikkin lasers! This made me spit out my drink and go: "WHAT. THAT'S AWESOME. SCIENCE IS SO COOL." Watch this great 4 minute video from Nature that describes optogentics in more detail. So far, optogenetic methods have already been used to make several advances in neurological research. Nature considered it so revolutionary, it was named Method of the Year in 2010. Recently, Stanford scientists were able to use optogenetics to demonstrate that the hypocretin or orexin, a neuro-transmitter that regulates appetite, arousal, and wakefulness, has a big impact on the sleep to wake transition through the stimulation of neurons in the locus coeruleus, part of the brain that stimulates noradrenaline and is critical for arousal and wakefulness. Neat! Read the SciCurious article "Sleeping Beauty: magic or hypocretin?" over at Scientific American for more details.